Is Fencing Good Exercise for Weight Loss? Are you looking for a fresh new way to spice up your workout routine? You can take a barre class to lose weight, check out any of the new spinning classes to slim down, or even start a CrossFit program for weight loss. But what about taking a fencing class? Many people are surprised to find out that fencing is good exercise. You've probably seen fencing during the Olympic Games. When you watch fencing on television it may not seem like the athletes are working very hard. But they are. On average, a 150-pound woman burns about 400 calories per hour while participating in a fencing workout or match. Surprised? Many new fencers are amazed at how intense the movement can be during a match. But keep in mind that you probably won't participate in a match for a full 60 minutes. There are three different types of weapons that you might use while fencing: epee, foil, or saber. The type of weapon determines the length of a match. Epee and foil matches consist of three 3-minute matches with a one-minute break in between, according to USA Fencing. Saber matches may last longer because they are based on "touches" or points. If you are new to fencing, you will probably spend more time doing fencing drills and exercises rather than formal matches. But the exercises keep your body moving and your heart pumping to improve your level of fitness, burn calories and lose weight. Your fencing workout can help you to build strength and endurance. Fencing drills also make you think fast so that you react more quickly. 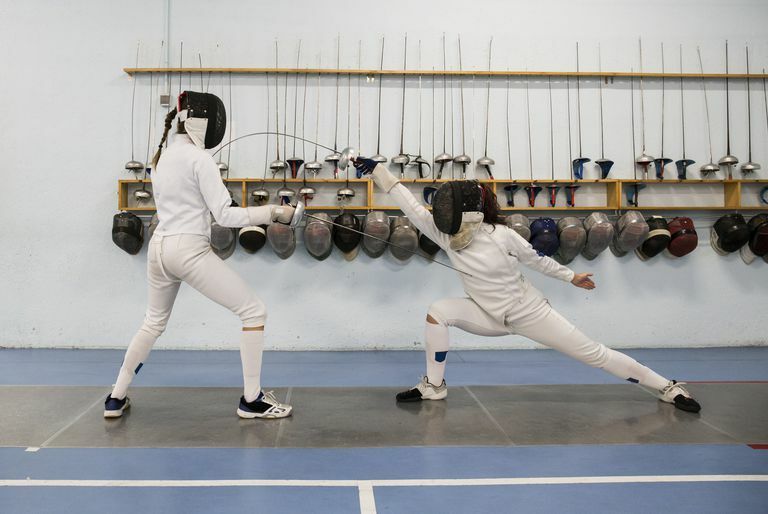 In addition to burning calories, fencing provides other fitness benefits as well. Dagmara Wozniak says that the sport can provide cardiovascular, strength, and even mental training benefits. Dagmara will be competing in her third Olympics in Rio de Janeiro, Brazil as part of the 2016 USA Fencing Team. "The beauty of the sport is that you can make it as intense as you want. You can focus more on technique with a limited range of motion or you can move your opponent up and down the strip until you both get winded and pass out. The intensity level is completely up to you." Teammate Monica Aksamit agrees. "Fencing is a great exercise. While it's certainly a lot of fun, it is also a great way to burn calories and build up your endurance." She adds that "strength training is also involved because you work many of the muscles in your legs, arms, and core." If you want to try fencing to burn calories, get in shape, or just add some variety to your fitness program, you'll want to find a beginning-level class in your area. Some fencing programs are geared for younger participants, but there are programs geared for adults as well. "Fencing is a great way to mix up your regular fitness routine," says Dagmara, adding that there are classes and memberships available at the Manhattan Fencing Center, where she trains. But if you're not in the New York City area, there are other locations that offer programs for beginners. According to USA Fencing, there are over 500 clubs in every state across the nation. To find a location in your area you can search their website. And there's no need to feel out-of-place when you attend. "We have moms, dads, and grandparents who start fencing at any age as well with both national and World Championship opportunities available for fencers ages 50 and older," they say. If you choose to try fencing as part of your weight loss program, you might want to pair it with other activities to stay active most days of the week. According to the American College of Sports Medicine guidelines, you should get 250 minutes per week of moderate physical activity to lose weight. Try adding one to two fencing classes to your weight loss walking program, yoga program, or swimming program. And remember to eat a healthy, calorie-controlled diet to make sure that you get the weight loss results you deserve. Should You Walk 10,000 Steps per Day for Weight Loss? Are There Any Benefits to 15-Minute Walks?